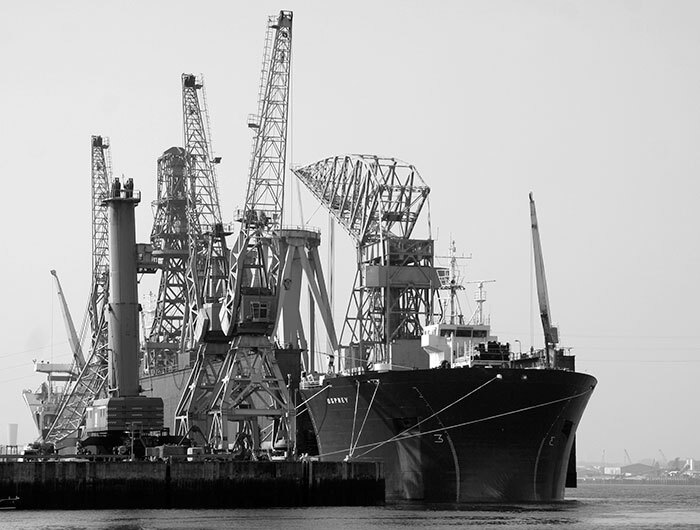 This gallery continues the sequence of images contained in the adjacent A WAKE FOR SWAN HUNTER 1. 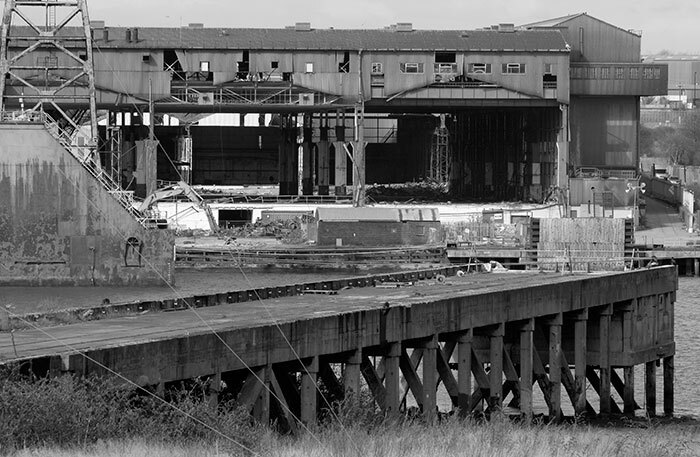 A range of derelict dry docks and slipways lie to the west of the main yard, stripped of all buildings, cranes and equipment. Here, unsynchronised dock gates stand open as tidal waters rise and fall. Stripping away the corrugated iron and flexible membrane cladding reveals contrasting engineering approaches to the structures beneath. 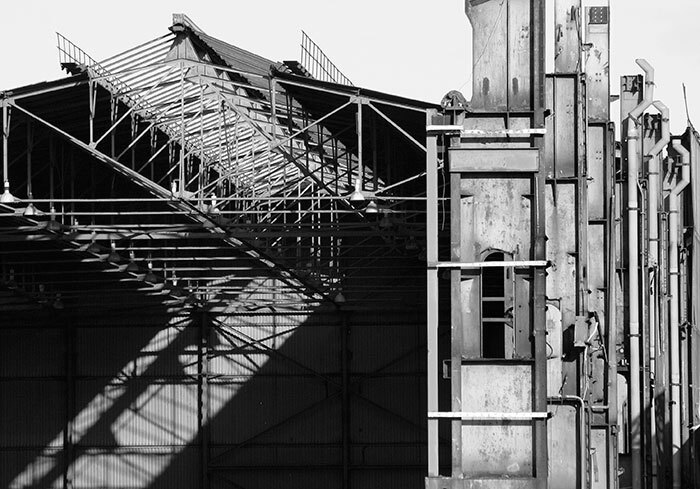 The older heavy steelwork enclosing a cavernous assembly building could have supported overhead cranes and other equipment used to fabricate and assemble sections to be brought together on the slipway. 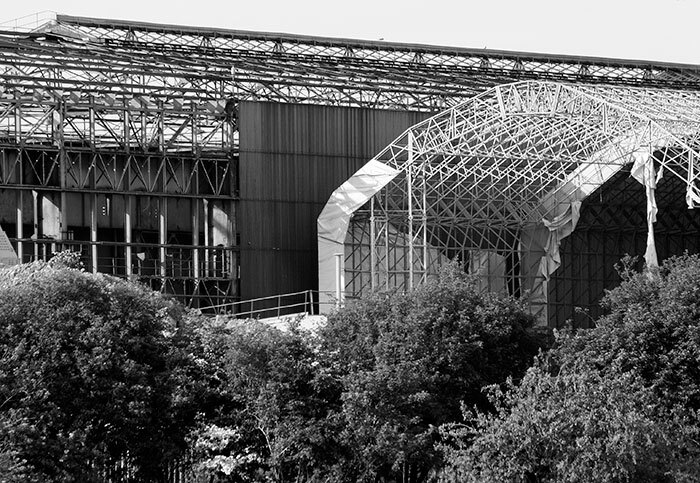 The lightweight metal space frame with covering membrane provided cover over outdoor work areas: others covered slipways. 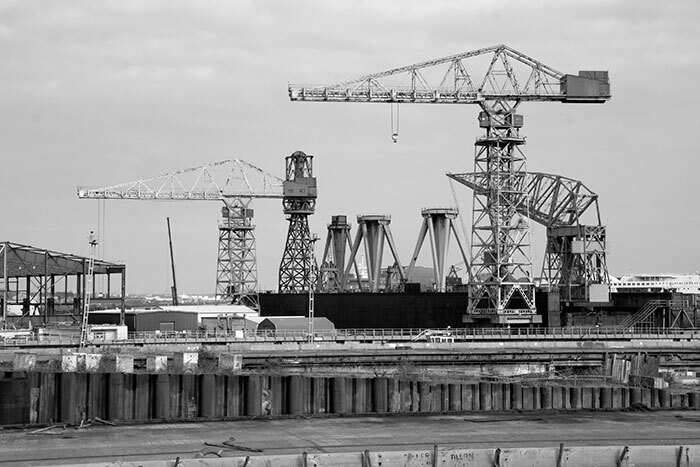 The cranes and buildings of the A & P Tyne ship repair yard stand beyond. 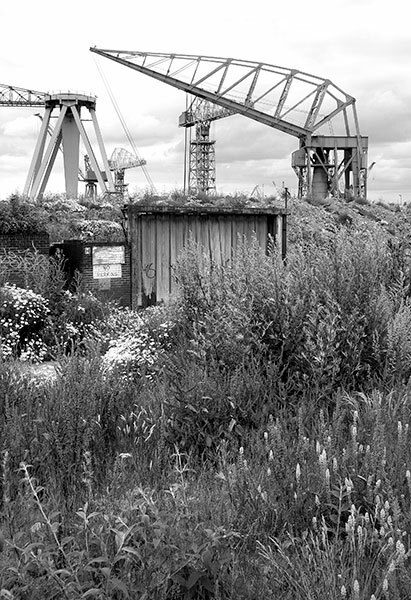 Breaks amongst the large areas of concrete floors from demolished buildings and dumps of soil and rubble were colonised by wild flowers, shrubs and small trees. The central grey rectangle is a pleated folding door to a building now demolished. 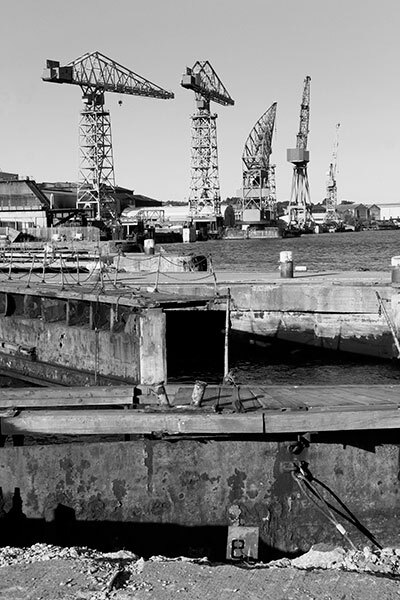 The cranes sit in the floating dry dock, itself docked within the yard. The floating dry dock is set dry into its own dock in the yard for loading dismantled cranes and other heavy equipment. The floating dock, loaded from the river, stands behind the rail tracks of the two 'mantis' cranes illustrated in the Swan Hunter 1 gallery. 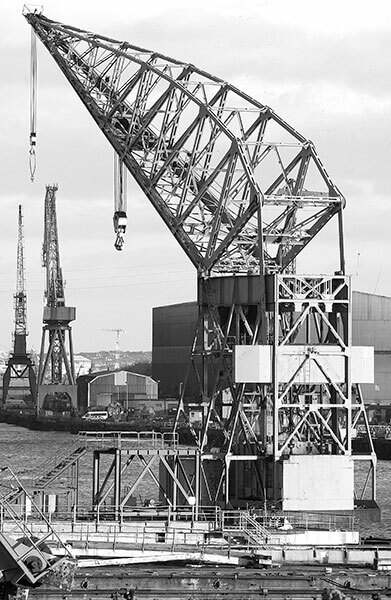 Two sections from the working superstructures of the 'mantis' cranes are set below the immense steelwork of their bases after loading into the floating dry dock. Shipbuilding and industrial areas on the Hebburn riverbank have been cleared for housing and almost rural parkland. This view is from the pleasant promenade that runs west to Bill Quay. 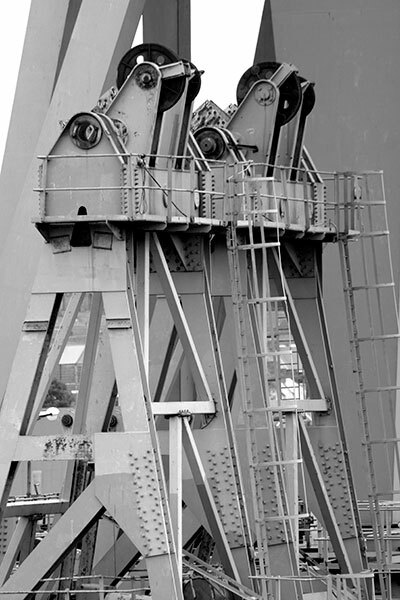 Part of the jib structures from a 'mantis' crane rests in the centre. 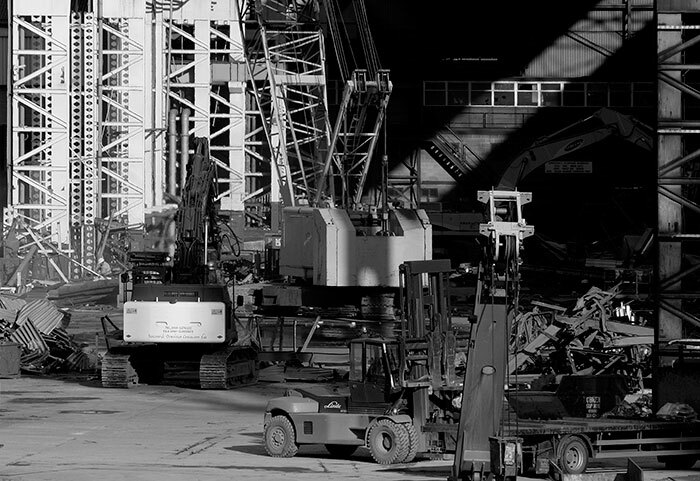 Cranes, demolition equipment and scrap metal stand within the once vast space of a construction shed. Partial removal of the glass and metal roof cladding created the differential lighting. Dismantling of such a large and complex set of buildings and structures must have required careful logistics planning. 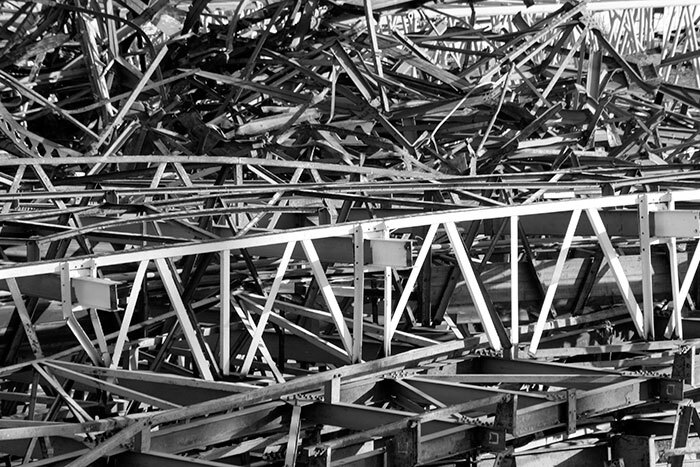 Movement, storage and disposal of structural steelwork such as this would have been continuous. I liked the contrasts in shapes, forms, patterns and lighting contained within the frame, itself sharply divided by the two markedly different structural designs within the buildings. 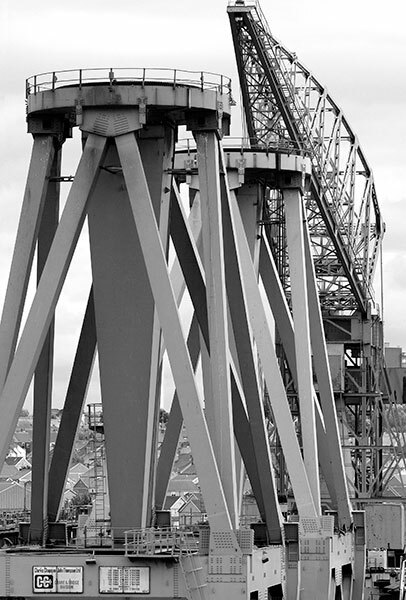 The exposed skeletal framework reveals a view of the River Tyne to the east. The tugboats to the right would eventually be involved in moving the floating dry dock and its cargo of cranes down to the Tyne Dock for loading on to the OSPREY, a specialist semi-submersible heavy lifting vessel. These lightweight space truss structures offer a flexible, speedy and less expensive means to enclose a large volume than traditional steel girder and truss solutions. Centred on a triangular module in steel or aluminium the system underpins many buildings more visually architectural than simple forms such as this. 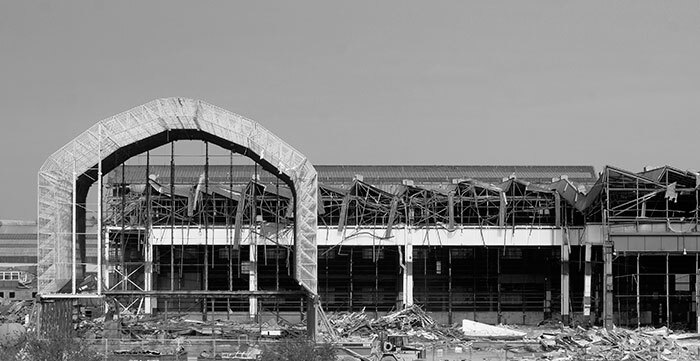 The technicalities of demolition are interesting as are the possibilities for formal image making that concentrates on the elements of form, shape and pattern across the picture plane. 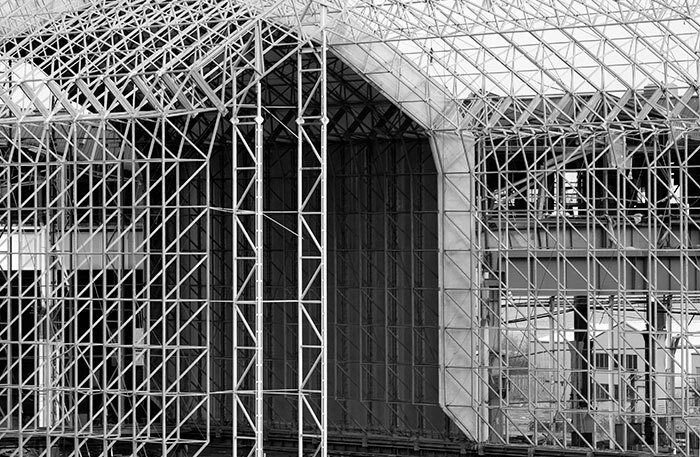 The strong white forms and the geometry created by the displaced steelwork appealed. I like to fit facades squarely into the picture frame whilst including an element that runs counter to absolute symmetry. The floating crane, four disassembled moving cranes and other equipment stand ready for towing down river to Tyne Dock and departure to India. 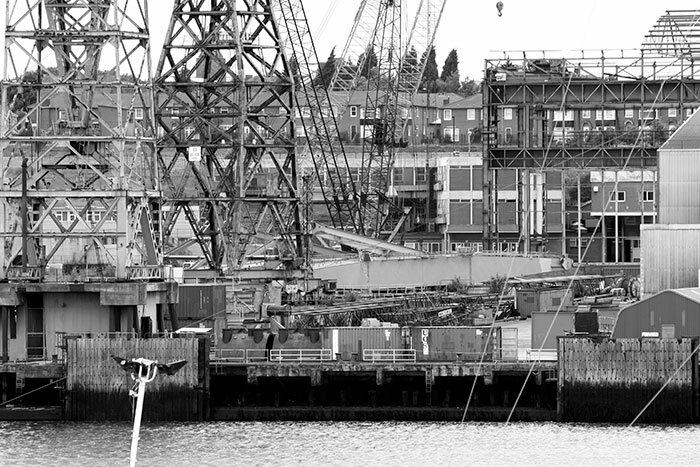 The dry dock basin and tracks guiding one of the crane tripods in Image 05 are in the foreground. 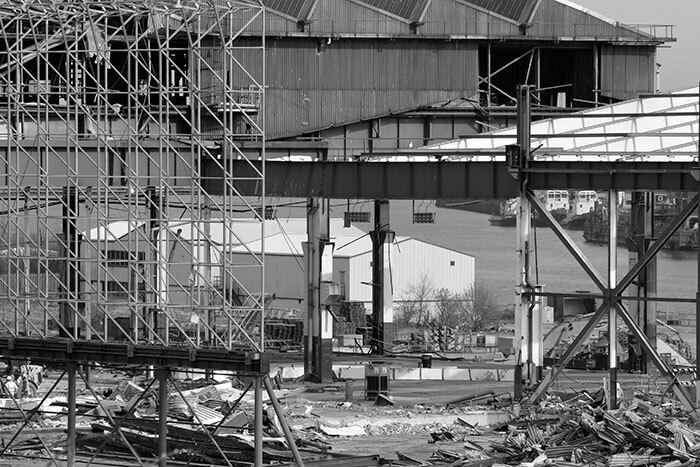 Slipways and sites of cleared construction sheds and workshops lie beyond. 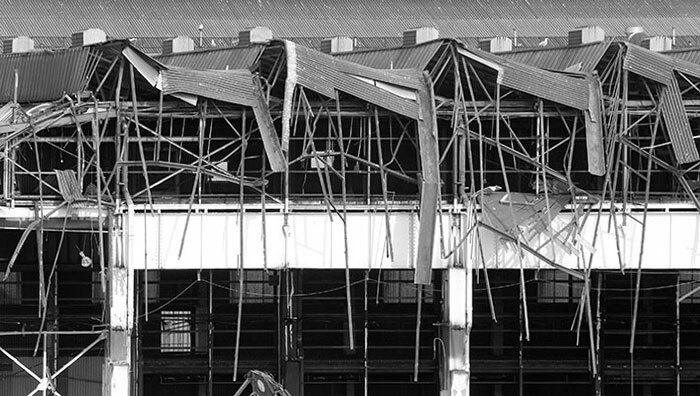 I was away from home in June 2010 when the remaining fixed dockside cranes were explosively demolished during the final clearance of the yard. 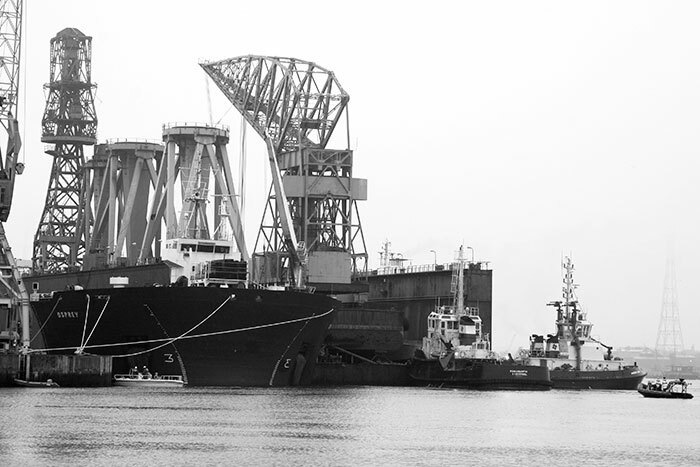 On a misty early morning start the tugboats brought the floating dock downriver to the already part-submerged hull of the heavy lift vessel, 'Osprey'. A close fit, the manoeuvre took some four hours before the tugs withdrew and pumping out the tanks of the semi-submersible began. Later in the afternoon the ship was moved across river to the Tyne Commission Quay but I'd already decided that I would not follow. I had hoped to photograph its final sailing on April 10 but was away from home. I should perhaps have spent more time around the yard over the two years covered by these images: if hindsight had been foresight much more would have been achieved!